Available in 14", 15", 16" and 17". 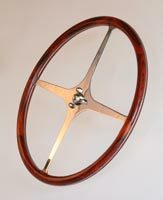 Speed and Chrome Studios has taken the classical styling of vintage steering wheels and created one to enhance a hot rod, sports car or early racecar. 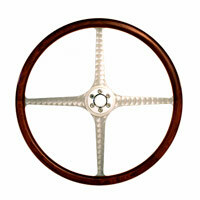 These wheels are handcrafted in the U.S.A. of the finest materials. 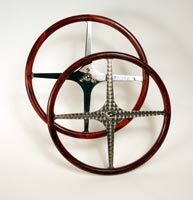 The spokes are of type 304 stainless steel that have been engine-turned on one side, and polished on the other. This makes the wheel reversible. The exotic rosewood is known as “Cocobolo”. It has been a favorite of cabinetmakers and gunsmiths for centuries, and is beautiful as well as durable. The standard three-bolt mounting makes for easy installation. This is the wheel for the hard-core enthusiast.